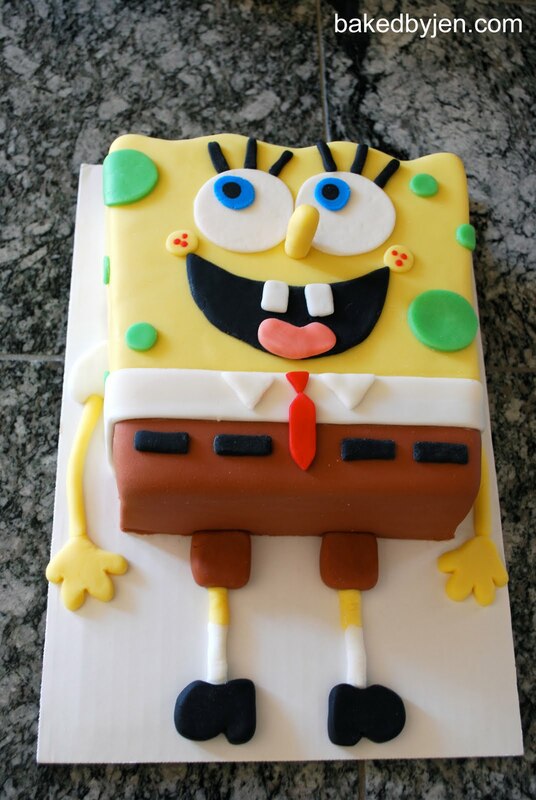 My nephew loves Spongebob; so, I had to try and make him a cake for his 9th birthday. 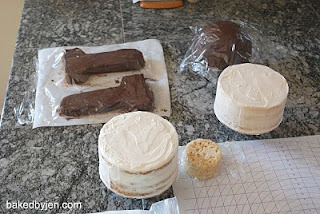 Because it was for family, I experimented with new cake flavors. It has a layer of vanilla cake (from Annie's Eats), strawberry cake (adapted from Cake Central), and Sylvia Weinstock's yellow cake (from About.com: Home Cooking). It was frosted with swiss meringue butter cream (adapted from Martha Stewart's Cupcakes) and then covered in marshmallow fondant. I must've done something wrong as the yellow cake recipe did not win myself nor my sister over. 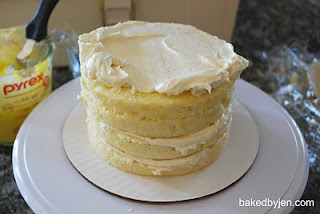 However, we loved the vanilla cake recipe! If I can't get my yellow cake recipe right, I might make this my go to. I almost got my strawberry cake recipe down, too. I just need to go and buy some strawberry extract to boost the flavor a bit. I didn't like the italian meringue butter cream I made last time but this swiss meringue butter cream is a bit tastier. 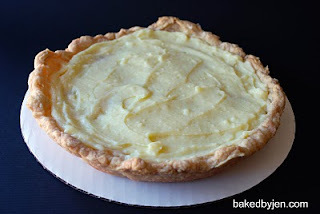 It's still an acquired taste as I'm so used to the sweetness from an american butter cream. Can't wait to see my nephew's face when I show up with his birthday cake, later today. UPDATE: My nephew pointed out that I forgot to put the red and blue stripes on Songebob's socks! As I mentioned in my previous post, I would eliminate the refrigeration after the crumb coat to see if my cakes remain moist. Well, I needed the frosting to firm up a bit before applying the fondant so I did end up putting it in the fridge. 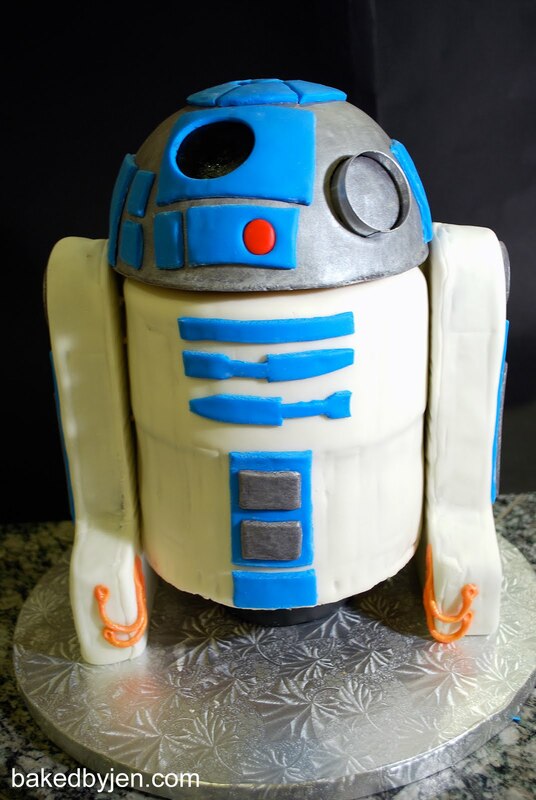 However, I made sure to saran wrap the cake first and I didn't leave the cake in the fridge that long. The cake was just as tender/moist as the day I made them. Success! Here it is! My first 3D cake. It wasn't as scary as I thought it would be. Having a time line helped a lot! Especially when I was trying to squeeze in a batch of sugar cookies in the same week. Much thanks to my brother who helped out with cutting all the details by free hand. The body was made of yellow cake and chocolate buttercream frosting and then crumb coated in vanilla buttercream frosting (adapted from Cake Central). The head and legs were made of rice krispies treats and chocolate ganache. I absolutely love working with ganache now. 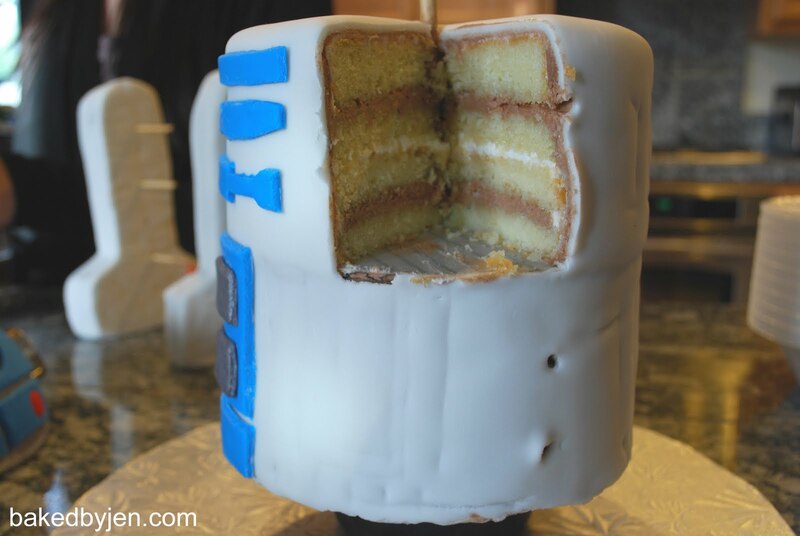 It held up 10x better than the butter cream. The body gave me a lot of trouble from air pockets to sagging and even cracking/splitting open the next day. 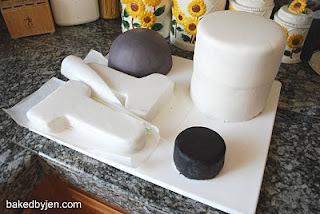 Instead of covering the body in sections or horizontally, I just rolled out a huge piece of marshmallow fondant and covered it as I would with any other cakes. Also, there was no way I was going to try and make black fondant. I had a 50% off coupon for Michaels and used it on a 2lb tub of Duff (Ace of Cakes) buttercream fondant. I heard many bad things about Wilton brand fondant but this one was yummy for store bought. Only worth buying with a coupon though. Making your own fondant is much cheaper. I figured out what I was doing wrong with my luster dust. I was suppose to mix it a little bit at a time with vodka to make a paint appose to wetting the surface and painting it on dry. So nice and shiny! The fondant underneath was actually a dark purple. You can't even tell! When I tasted the cake scraps earlier in the week, it was so good! 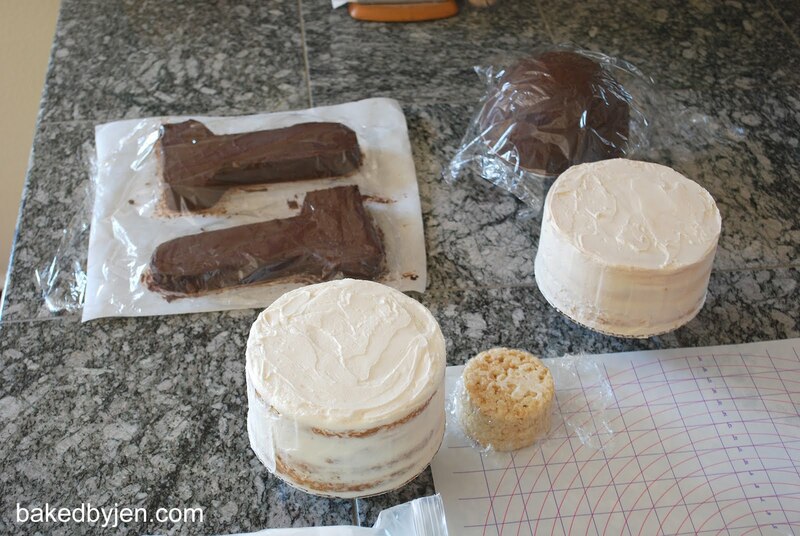 I saran wrapped and froze the cakes overnight before the torte/fill/crumb coat step. And then, I put it back in the fridge after the crumb coat. Somewhere, something went wrong. The cake was crumbly and dry like cornbread! I got another cake to make this week. Going to eliminate the fridge after the crumb coat step and see what happens. I'm working on something HUGE this week but I can't let the cat out of the bag yet. 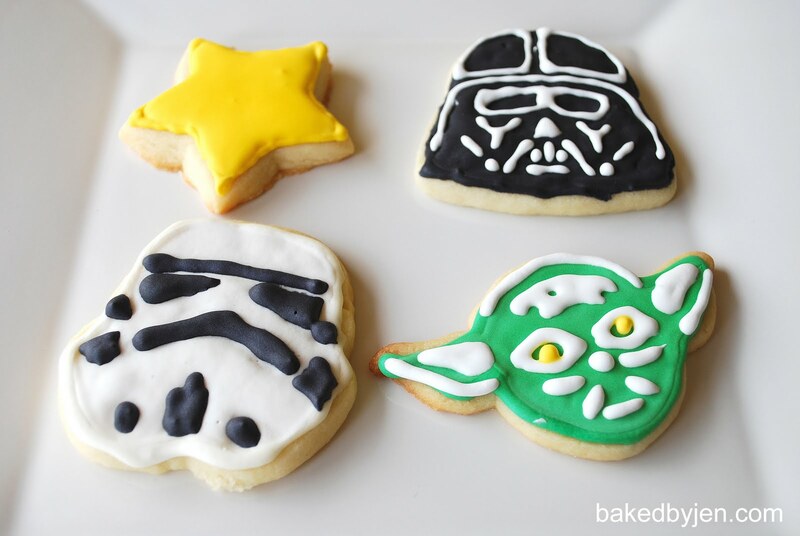 In the meantime, enjoy looking at these awesome sugar cookies (from Cake Central) my sister, my brother and I made for an avid Star Wars fan. The cookies themselves tasted amazing but the royal icing (from Wilton) took it to another level. 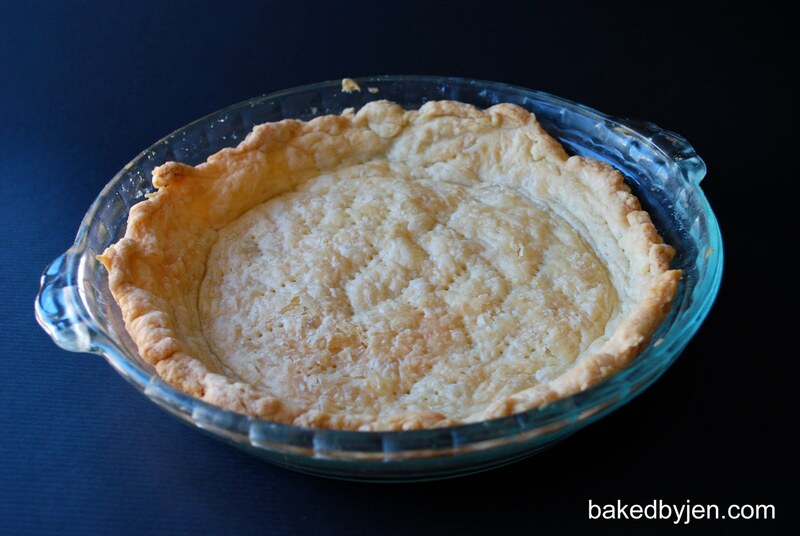 It sort of holds the cookie together as they have a soft, melt in your mouth texture. The cookie cutter set came from Williams-Sonoma. It also included Boba Fett but he had one too many colors which we didn't want to figure out. Baked these cowboy cookies (from Bakerella) with my sister as a bridal shower gift for her friend. Instead of giving the blushing bride just the box of containers from her registry, we filled them up with cookies and the cookie mix. 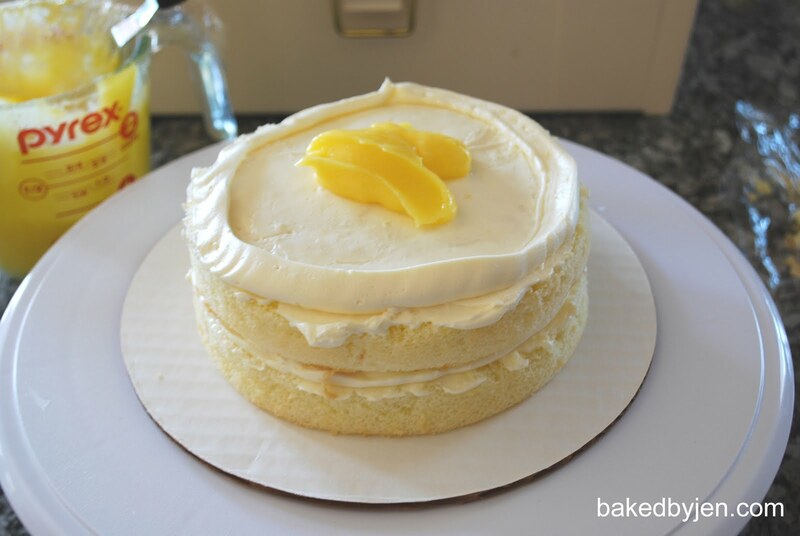 Our lemon tree out back gave us lemons just in time to make a cake for my mom for Mother's day. 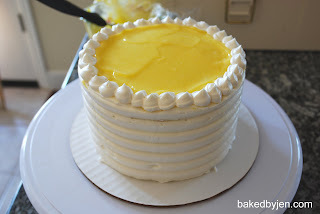 I pulled out all the stops on this one as I never made neither a lemon chiffon cake (adapted from All Recipes) nor lemon curd (from Martha Stewart's Cupcakes) nor italian meringue butter cream (from Cake Central)!!! Not sure I'm ready to move away from the american butter cream frosting for IMBC yet. It was a dream to cover the cake with, very smooth. However it tasted too buttery, even at room temperature, for me. 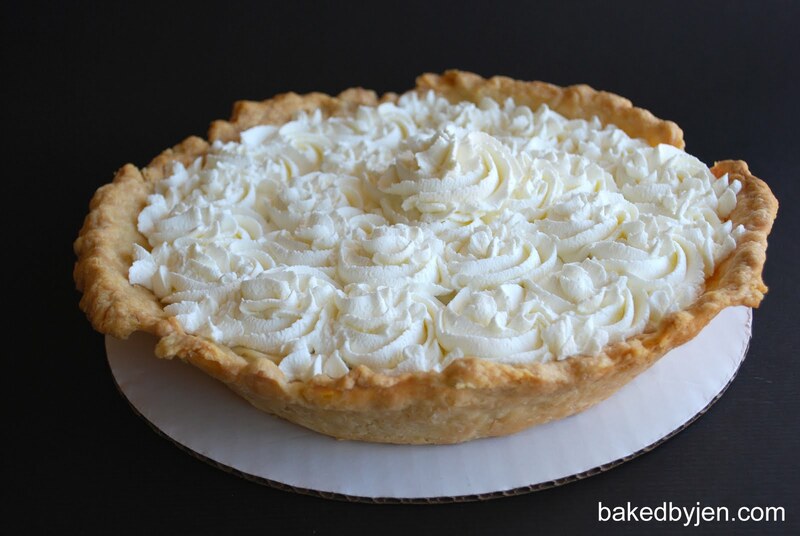 Naturally, I offer to bring dessert to a dinner party at a friend's house. 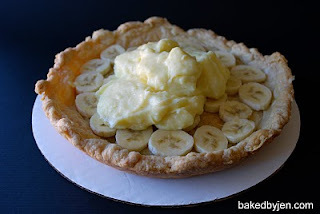 I knew I wanted to make a banana cream pie after finding a basic pie crust recipe in my new cookbook, Ad Hoc At Home. (Spent last weekend in Napa and was very fortunate to be at Ad Hoc on the day they were serving Chicken and Waffles.. best I ever had! Had to pick up a copy of their cookbook which was already signed by Chef Thomas Keller but then Chef Dave Cruz signed and dated it that day as well. So awesome!) Already prepared with a bunch of bananas, a go to pastry cream recipe (adapted from All Recipes), and a go to whipped cream frosting recipe, this was very easy to put together the day of.